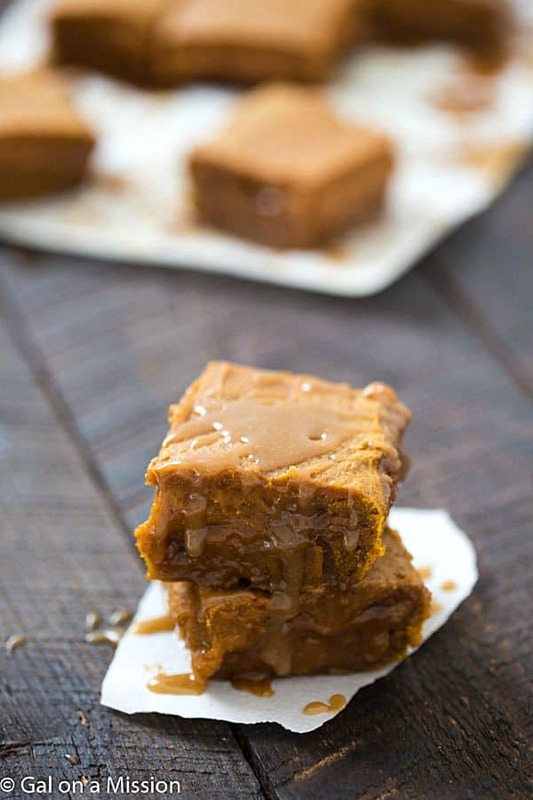 Pumpkin Pie Caramel Blondies – Rich, gooey and the perfect fall dessert! Hey! It’s Chelsea from Gal on a Mission back again for a yummy fall dessert everyone will love! If you are looking for an outrageously delicious fall dessert, then these blondies are for you! 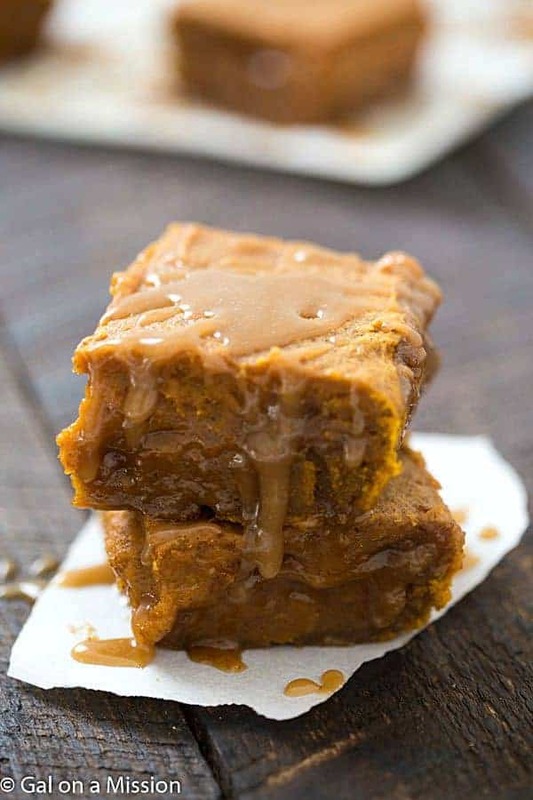 They are the ultimate pumpkin blondies, filled with homemade caramel sauce and then topped with more caramel sauce. Talk about amazing. They are gooey and the best. Even the pickiest pumpkin eater will love these blondies. They are the best when warm with a scoop of vanilla ice cream on top. Just talking about it is making me crave these pumpkin pie caramel blondies for dessert. This week in our home, we have been craving everything with apples and apple spice. 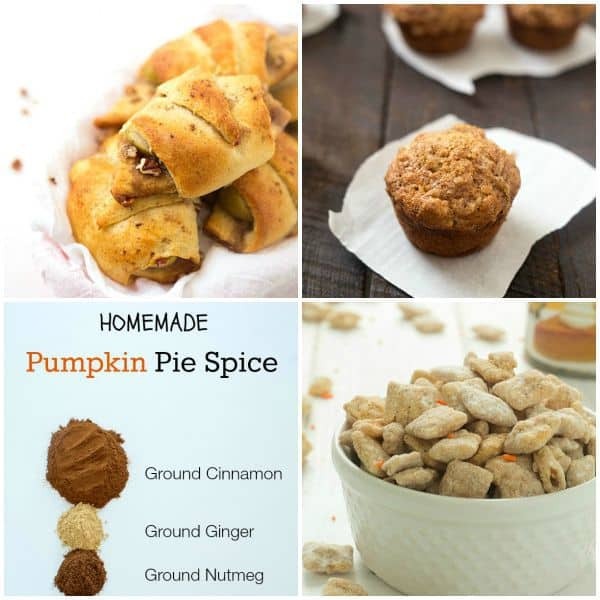 After making these blondies, I am starting to want everything pumpkin, especially pumpkin spice lattes – yum! A couple of tips when making these blondies. Depending on how thick you would like them, you can use a 9×9 inch baking pan or a 9×13. I used a 9×9 inch pan because I like my blondies thick and gooey. To have the blondies gooey, you will want to underbake them slightly. Allow them to finish cooling in the pan, though – they will finish baking in the warm pan. Prepare your caramel by whisking together butter, brown sugar, heavy cream, and vanilla extract in a microwave-safe bowl. Microwave for 2 minutes and stir, microwave for another 2 minutes and stir, then microwave for 2 more minutes and stir. Allow the caramel to cool down for 5-10 minutes. Set aside. Preheat oven to 350 degrees. Place parchment in a 9x9 baking pan and allow the sides to hang. Set aside. Whisk together flour, pumpkin pie spice, and salt together in a small mixing bowl. Mix together the melted butter, brown sugar, granulated sugar, egg, vanilla extract, and pumpkin puree in a large mixing bowl. Slowly fold in the dry ingredients into the wet ingredients. Pour half the blondie batter into the pan, then add ¾ of the caramel sauce on top, then pour the rest of the batter on top of the caramel sauce. Bake for 40 minutes or until an inserted toothpick comes out clean. Allow the blondies to cool to room temperature and then slice. Serve with remaining caramel sauce on top. Tasted yummy but…. didn’t look like the picture, at least twice as thick. 9X9 pan, really? The batter filled a 9X9 to the top. Also had issues with the caramel I think because microwaves come in so many wattages and timing will not be the same for all, mine was more candy than sauce. Worked fine for the interior layer while it was still warm but by the time I wanted to pour the rest on top the rest was candy and not pour able. May have to try a larger pan and fewer microwave minutes.